Longyearbyen, the northernmost town in the world, lies on the Svalbard Islands of Norway. With a permanent population of over 1,000 people, the former coal mining town is now the cultural and commercial center of the Svalbard Islands, featuring the northernmost ATM, church, museum, post office, radio station, airport, and university in the world. PanARMENIAN.Net - Known as Longyear City until 1926, the town was established by and named after John Munro Longyear, whose Arctic Coal Company started coal mining operations in 1906. Operations were taken over by Store Norske Spitsbergen Kulkompani (SNSK) in 1916, which still conducts mining. The town was almost completely destroyed by the German Kriegsmarine on August 8, 1943, but was rebuilt after the World War II. Traditionally, Longyearbyen was a company town, but most mining operations have moved to Sveagruva since the 1990s, while the town has seen a large increase in tourism and research. This has seen the arrival of institutions such as the University Centre in Svalbard, the Svalbard Global Seed Vault and Svalbard Satellite Station. Though a Norwegian territory, Svalbard does not belong to Norway proper. Before boarding flights from Oslo or Tromsø – and after disembarking on return to the mainland – passengers have to go through passport control. The territory is governed under the terms of the Svalbard Treaty, which allows citizens of all signatory nations to commercially exploit the land and waters around and take employment in the territory. This explains the existence of Russian mining towns in Svalbard – Pyramiden (closed in 1998) and Barentsburg, which had 380 inhabitants at last count. As of 2015, Longyearbyen had a population of 2,144 people. The largest regional group of Norwegians are from Northern Norway, particularly Nordland and Troms, which make more than 40% of the population. Roughly 300 people (16%) are non-Norwegian citizens, with the largest nationalities being from Thailand, Sweden, Russia and Ukraine. Because of the dominance of the mining industry, the gender distribution is skewed with 60% of adults being males. Longyearbyen experiences a very high turnover; in 2008, 427 people moved away from the town. The average person lived in Longyearbyen for 6,3 years, although it is 6,6 years for Norwegians and 4.3 years for foreigners. 70% of households consist of a single person compared to 41% on the mainland. The difference is largely caused by persons working on Svalbard while their family remains on the mainland. Due to the town’s precarious latitude — at 78 degrees north — there are a few strange rules that all people living in Longyearbyen must abide by. The most bizarre is that it is illegal to be buried here. The permafrost and sub-zero temperatures in Longyearbyen make it so that any dead bodies lying six feet under are perfectly preserved, as if mummified, thus attracting predators, specifically polar bears. Therefore, the government of Svalbard requires that any dead bodies must be flown by plane or shipped by boat to mainland Norway for burial. This law has been in effect since 1950. Pregnant women are also transported to the mainland to give birth to their babies. The freezing temperature requires that all houses must be built on stilts, so that when the island’s layer of topsoil melts in the summer houses don’t sink and slide away. Cats are banned from the city, in order to protect endangered Arctic birds, and due to the impending threat of polar bear attacks in the frigid Arctic Circle, all residents are required to carry a high-powered rifle at all times. 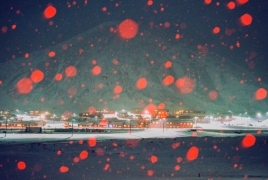 Every year, on March 8 at 12:15 pm, the people of Longyearbyen celebrate “Solfestuka,” a holiday honoring the town’s first glimpse of the sun in over four months. The community council runs a number of cultural activities, such as a cinema, a youth club, a library and a gallery. The town's sports club is Svalbardhallen, an indoor sport center that includes a multi-sport hall large enough for handball or three badminton courts, a shooting range and a 25-meter swimming pool. Svalbard Church of the Church of Norway has the entire archipelago as its parish. Svalbardposten is a weekly newspaper published on Friday. Printing takes place in Tromsø and the majority of subscribers live on the mainland. Icepeople, an alternative newspaper in English, is also published weekly. There are two museums in town, Svalbard Museum and the Spitsbergen Airship Museum. The University Center in Svalbard (UNIS) has 350 students and a permanent faculty of 40 professors and assistants, as well as 120 guest lecturers. UNIS does not offer degrees, but instead offers semester courses in biology, physics and geology. Snowmobiles are a popular mode of transport and there are more snowmobiles than residents. In 2008 there were registered 2,672 snowmobiles and 69 percent of households owned at least one. Off-road motorized transport is prohibited on bare ground, but snowmobiles are used extensively during winter—both for commercial and recreational activities. “Although it is difficult to regard it as the best place to live, many people fall in love with it at first sight. Some people came here just for two weeks and have stayed for five years or more. But not many decide to settle down here permanently. Sometimes you get the impression that people here are trying to escape from something; that this is just a retreat. This is not a real life,” Polish photographer Dominika Gesicka said after visiting the world’s northernmost town. No Armenians hurt in deadly Sri Lanka bombings No Armenian citizens or nationals were among the casualties of the deadly terrorist attacks in Sri Lanka.